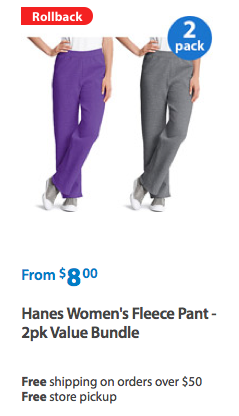 Hanes Women's Fleece Pant - 2pk Value Bundle Only $4 Each + FREE Store Pickup! You are here: Home / Great Deals / Hanes Women’s Fleece Pant – 2pk Value Bundle Only $4 Each + FREE Store Pickup! Hanes Women’s Fleece Pant – 2pk Value Bundle Only $4 Each + FREE Store Pickup! WOW! Stay warm and cozy with this next deal! You can currently snag this Hanes Women’s Fleece Pant – 2pk Value Bundle for only $4 Each + FREE Store Pickup if available in your area! You’ll pay just $8 total for TWO of these! How awesome is that?! Hurry and choose your bundle before they run out!